Geneva – IOM, the UN Migration Agency, reports that 120,137 migrants and refugees entered Europe by sea in 2017 through 20 August, with almost 82 per cent arriving in Italy and the remainder divided between Greece, Cyprus and Spain. This compares with 269,856 arrivals across the region through 20 August 2016. IOM Spain reports that the total migrant and refugee sea arrivals had reached 8,385 by 9 August, not counting the 600 or more migrants rescued at sea earlier this week. 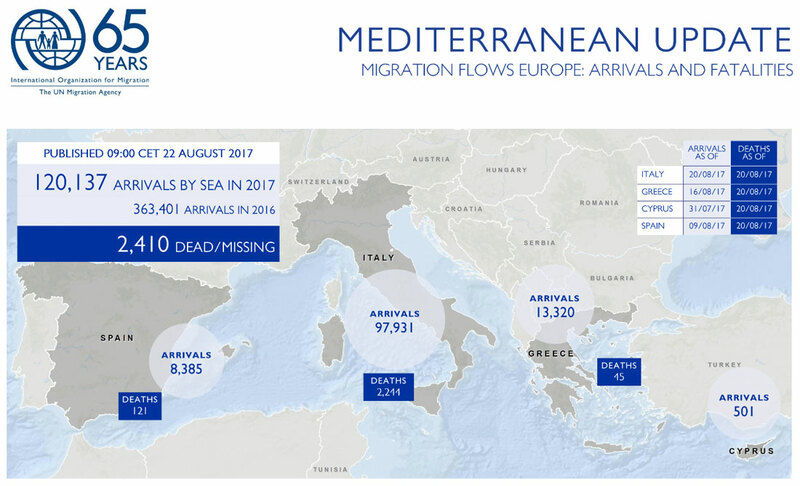 The official number – 8,385 – is greater than all sea arrivals recorded during 2016, when the full year count totalled 8,162 (see chart below). Estimated sea arrivals to Spain since 1 June 2017 are approaching 6,000, with over half of those (3,181) just in the month of June. Last year’s busiest month for sea arrivals off Spain was November when 1,855 arrivals were recorded. IOM Libya’s Christine Petré reported that on 16 August, 107 migrants (including six women) were rescued off Al Khums by the Libyan Coast Guard. So far in 2017, 12,945 migrants have been rescued in Libyan waters. 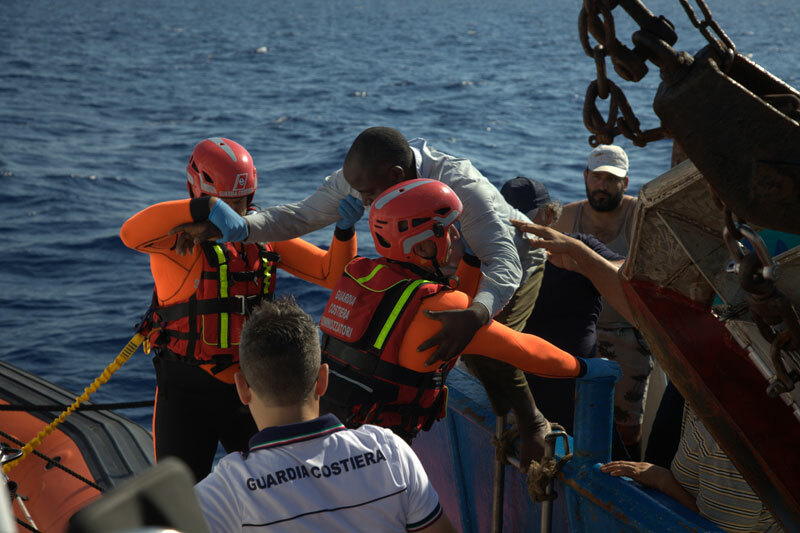 IOM Rome reported Sunday, 20 August, that according to official figures of the Italian Ministry of Interior, 97,931 migrants have arrived by sea to Italy this year, which is 5.55 per cent less than last year in the same period. IOM Athens has reported 13,320 arrivals as of 20 August arriving on the islands of Lesvos, Chios, Samos and Chilos. According to data collected by IOM Regional Officers at the Greek islands, it is being estimated that among migrants arrived by sea to Greece in 2016 there were approximately 42 per cent male, 21 per cent female and 37 per cent children.